I Kowloon park i Hong Kong är det mesta förbjudet. Kolla uppräkningen på skylten ovan!!! 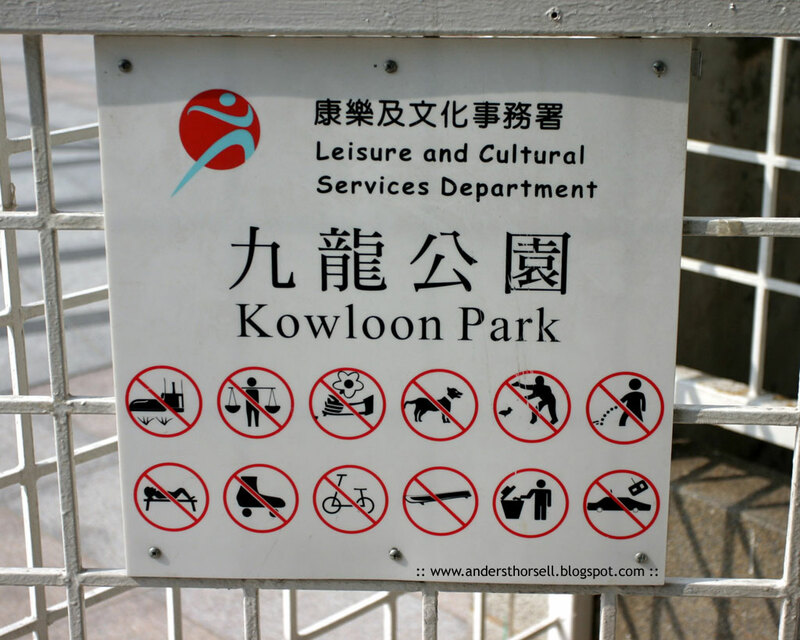 The Kowloon Park is a large public park in Tsim Sha Tsui, Kowloon Peninsula, Hong Kong. The park is managed by Leisure and Cultural Services Department. The park was formerly a site of Whitfield Camp barracks for British force with a battery (Kowloon West Battery II) on its west side. In 1970, Urban Council redeveloped the site into the Kowloon Park. Part of the site was occupied in the construction of the MTR from 1975 - 1978.